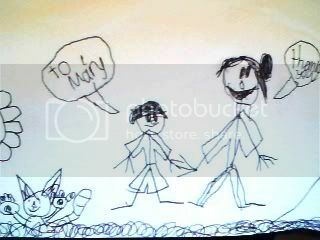 I just found this in a drawer in my desk: a drawing my brother made me of the two of us. His artwork always makes me smile. (2) I did not do my long run (3.75 miles) yesterday because I had a big family issue come up - I'll talk about it tomorrow, and I'll run today. Problem solved. (3) Symposium proposal submitted! Even if we don't get accepted to present, I'll likely still attend for my own knowledge ... and networking. (4) My students took an exam on Friday; I've only finished grading half, but I'm amazed at how many A's there are! Well, not amazed, per se - they did a great job with the material, especially considering we lost a day of class to the blizzard. But I'm very, very pleased! (5) I tried oysters, which I will count for #75 (Try 2 new fish). (7) I bought three new shirts and a new pair of jeans - size 16! I cried a little, to be honest - they looked so small, but then I put them on, buttoned, and just stood there crying. Me! A girl in size 16 jeans! Totally exciting. (9) I wore makeup to work this week - nothing too fancy or excessive, just a little eyeliner. But I liked it and it made me feel very pretty. What goal are you doing best on? Try to talk about the goals you still have left, address whether you've completed some, but focus on ones you still have to complete. I try to work a little on each goal every week, but some things I tend to do more than others. I haven't visited any museums on their free days and I have not yet been to the opera - so I've got to get on that! Maybe I'll head to the Field Museum today - they're free the second Monday of every month. What goal do you have to push yourself a little more to complete? What is your plan to do so? Though it may seem a bit backwards, I think the hardest goals for me to complete are making art and doing something to feel gorgeous. It's easy for me to choose to go for a run these days, or to try something new to eat, or to be the best teacher I can be. But to put aside a little time and focus on me and my creative output? It can be tough! We've talked about who pushes us to do better with our goals – is there anyone/thing that hinders you? I'm the one who pushes me to do better, but I'm also the one who gets in my way sometimes. When others are introduced into my routines, I struggle a bit, but it's almost always a temporary state - being around family at the holidays was tough, but I survived and got right back into my habits and patterns. But I'm a responsible adult who lives alone, so every decision is my own - from what I buy at the grocery store, to if/when/how long I go to the gym. Whether you've lost one pound or one hundred, sometimes doing the right thing is still tough. Happy Valentine's Day! Do you have any special plans for the day? It's okay if you think it's a Hallmark holiday that you wish to boycott! Relaxing, and possibly going to the Field Museum if I can motivate myself! Good morning. Stopping by from Allan's blog. I love your Q&A's, interesting to read. Size 16 is awesome. I did the same thing at Kohl's when I got my first pair in the normal sizes. It was zn amazing feeling. Keep up the great work. have fun at the museum! you are doing such a good job. I can't even believe you are in a 16! That's smaller than me and I was gonna give you some clothes awhile back! Congrats on all the NSVs!! !